The St. Louis Cardinals visit Miller Park on Wednesday, August 30, 2017 to play the Milwaukee Brewers. The probable starters are Carlos Martinez for the Cardinals and Chase Anderson for the Brewers. The opening line for this matchup has St. Louis at -123 and Milwaukee at +113. The Cardinals have a 67-55-8 over/under record and a 61-69-0 run line mark. The Brewers are 69-62-0 against the run line and have a 57-68-6 over/under record. The Cardinals have a 65-65 overall record this season. Starting pitcher Carlos Martinez has a 10-9 record with an earned run average of 3.48 and a WHIP of 1.19. He has 175 strikeouts over his 168.1 innings pitched and he's given up 143 hits. He allows 7.6 hits per 9 innings and he has a FIP of 3.85. The bullpen has an earned run average of 4.08 and they have given up 400 base hits on the year. Teams are hitting .249 against the bullpen and they've struck out 416 hitters and walked 150 batters. As a team, St. Louis allows 8.7 hits per nine innings while striking out 8.3 batters per nine innings. They are 8th in the league in team earned run average at 4.02. The Cardinals pitchers collectively have given up 1,130 base hits and 521 earned runs. They have allowed 149 home runs this season, ranking them 25th in the league. St. Louis as a pitching staff has walked 396 batters and struck out 1,071. They have walked 3.1 men per 9 innings while striking out 8.3 per 9. They have a team WHIP of 1.31 and their FIP as a unit is 4.11. As a team St. Louis is hitting .262, good for 8th in the league. The Cardinals hold a .431 team slugging percentage and an on-base percentage of .337, which is good for 3rd in baseball. They rank 11th in MLB with 8.9 hits per game. Matt Carpenter is hitting .244 with an on-base percentage of .377. He has 104 hits this season in 426 at bats with 61 runs batted in. He has a slugging percentage of .439 and an OPS+ of 114. Yadier Molina is hitting .281 this year and he has an on-base percentage of .315. He has totaled 118 hits and he has driven in 60 men in 420 at bats. His OPS+ is 96 while his slugging percentage is at .440. The Cardinals have 1,152 hits, including 241 doubles and 155 home runs. St. Louis has walked 463 times so far this season and they have struck out 1,082 times as a unit. They have left 900 men on base and have a team OPS of .768. They score 4.7 runs per contest and have scored a total of 611 runs this year. Milwaukee has a 68-63 overall mark this year. With an earned run average of 2.87, Chase Anderson has a 7-3 record and a 1.13 WHIP. He has 95 strikeouts over the 100.1 innings he's pitched. He's also given up 81 hits. He allows 7.3 hits per nine innings and his FIP stands at 3.54. The bullpen has an earned run average of 4.00 and they have given up 423 base hits on the year. Teams are hitting .247 against the Brewers bullpen. Their relievers have struck out 471 batters and walked 223 opposing hitters. As a team, Milwaukee allows 8.8 hits per nine innings while striking out 8.3 batters per nine innings. They are 10th in the league in team earned run average at 4.08. The Brewers pitchers as a team have surrendered 1,140 base knocks and 529 earned runs this season. They have given up 156 home runs this year, which ranks 20th in Major League Baseball. Milwaukee as a staff has walked 464 hitters and struck out 1,078 batters. They give up a walk 3.6 times per 9 innings while they strike out 8.3 per 9. Their team WHIP is 1.37 while their FIP as a staff is 4.35. As a team, they are batting .249, good for 21st in the league. The Brewers hold a .435 team slugging percentage and an on-base percentage of .320, which is good for 20th in baseball. They rank 23rd in MLB with 8.4 hits per contest. Orlando Arcia comes into this matchup batting .274 with an OBP of .318. He has 116 hits this year along with 42 RBI in 424 AB's. He maintains a slugging percentage of .413 with an OPS+ of 88. Domingo Santana is hitting .271 this season and he has an OBP of .367. He has collected 117 hits in 431 at bats while driving in 65 runs. He has an OPS+ of 116 and a slugging percentage of .471. 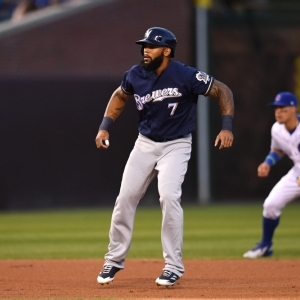 The Brewers as a unit have 1,106 base hits, including 219 doubles and 188 homers. Milwaukee has walked 426 times this year and they have struck out on 1,286 occasions. They have had 876 men left on base and have an OPS of .755. They have scored 4.55 runs per game and totaled 596 runs this season.